This post is written by Jaclyn Reynolds, public relations and social media manager for COSI. Can you believe we’re almost halfway through the summer? 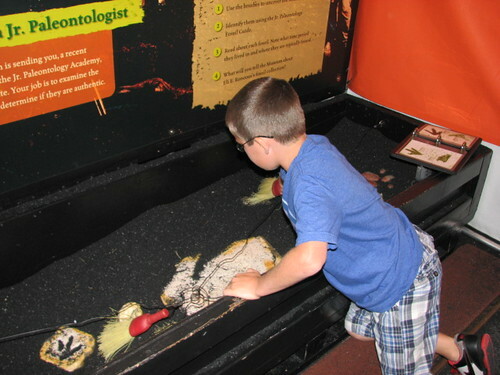 For me, Labor Day seems to signal the official end of summer, and for COSI , it signals the end of Dinosaurs: Explore. Survive Escape.. It seems like just yesterday the animatronic dinosaurs were being loaded off the truck and we were anticipating the opening of the exhibit. Now, with just about four weeks left, it’s amazing to think our unique summer exhibit will be loading back onto trucks and going their separate ways to their next destinations. When COSI was on the lookout to bring a summer exhibitions, thoughts were all about dinosaurs. But nothing out there really seemed like the perfect fit for what we wanted. We were thinking big and unique, kind of like dinosaurs themselves. We found three different exhibits, each, while good would not be enough to stand alone, so we decided to combine them into one truly dino sized experience. And Dinosaurs: Explore. Escape. Survive. was born. When I first saw the animatronic dinosaurs I couldn’t believe how real those robot-like beasts looked! I was standing alone in the exhibit during an early morning television shoot and T.Rex seemed to be sizing me up. I thought he was going to jump out of his enclosure for a Jaclyn snack! My poor triceratops didn’t stand a chance when I was playing the computerized simulation pods – I was eaten by a T.Rex just minutes after sitting down. I did much better in the maze, answering questions that tested my prehistoric knowledge in order to wind my way through but it may have taken me a little longer than the average dinosaur buff. All in all I think the dinosaur exhibit is really cool and something to be seen, but you don’t have to take my word on it. Amy Donaldson, a Columbus parent and blogger at livelovemom.com , got a chance to see the exhibit recently with her little ones. "Exploring the Dinosaur exhibit at COSI was amazing from start to finish. My kids love Dinosaurs and this exhibit is truly wonderful. I love how we can learn so much while having so much fun too." 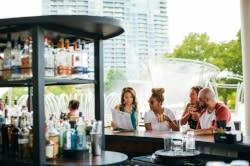 "The kids loved the 3000 sq. ft. maze and being able to make Dinosaur tracks, climb the rock wall and dig for Dinosaur bones while learning something new every step of the way." 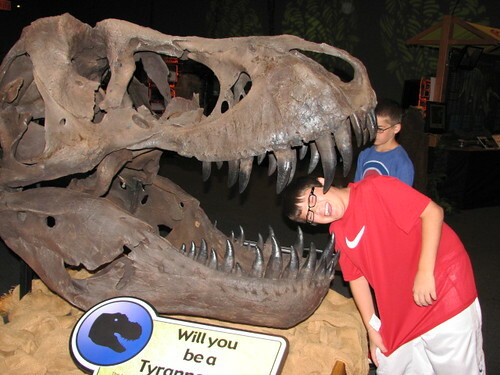 "The Dinosaur T-Rex head was fun to pose with for funny pictures, after all that is what being a kid is all about." "We all enjoyed playing the "Be the Dinosaur" video game where you could walk around like a Dino and do Dino things like eating and drinking water and even go to the bathroom, the kids got a big laugh out of that feature." Dinosaurs: Explore. Escape. Survive. will become extinct after September 5, 2011. Come in and check out the massive exhibit before they become prehistoric history. And let us know what you think, we would love to hear about your experience!